Health care not provided by public health care services: eye and dental care. In Ontario there is a 3 month waiting period from the date of arrival of the sponsored spouse before they are eligible for OHIP (Ontario Health Insurance Plan). The sponsor (and the co-signer, if applicable) agrees to provide the basic necessities for your sponsored spouse and any dependent children outlined in the undertaking. This is so your partner will not have to go on social assistance. The sponsored spouse agrees to seek assistance from the sponsor if unable to provide for their own basic requirements, before going to the Government of Ontario to seek social assistance. The sponsored spouse agrees to the release of information on any social assistance received to the sponsor during the period of the undertaking. The period of the undertaking for spousal sponsorship is 3 years from the date the sponsored spouse receives their permanent residence (inland), or from the day your sponsored spouse arrives in Canada as a permanent resident (outland). If your sponsored spouse has a dependent child then you the sponsor are responsible for the child for a period of 10 years or until they are 25 years old. Ontario Works (OW) is a program of the Ontario Ministry of Community and Social Services that provides income assistance to Ontario residents in need. Ontario Disability Support Program (ODSP) is a program of the Ontario Ministry of Community and Social Services that assists people with disabilities who are in financial need, or who want to and are able to work but need financial support. If the sponsored spouse does not seek social assistance from either program listed above and instead uses self-support solutions to pay for his or her basic necessities then there is not considered to be a Sponsorship Breakdown. Attempt to first receive assistance from you the sponsor unless the sponsorship breakdown is caused by family violence; AND the sponsored spouse must provide information to the OW or ODSP about the sponsor. The OW or ODSP will determine if the sponsored spouse has no private means of self-support before approving the application for social assistance. The amount of social assistance will be the same as any other applicant in Ontario. Any partial support provided by the sponsor will be treated as income and deducted from the social assistance paid out. If your sponsored spouse does seek social assistance (i.e. a sponsorship breakdown occurs) then you the sponsor (and the co-signer) are in sponsorship default and are legally responsible for and must repay any social assistance payments your spouse receives. Until the debt owed to the government of Ontario is repaid in full, you the sponsor will not be allowed to sponsor any other family member. Overpayment Recovery Unit: the ORU is responsible for collecting the debts resulting from sponsors who have defaulted on their sponsorship agreements. The sponsored spouse also has responsibilities under sponsorship agreement which they have signed as well: they must first attempt to support themselves and then ask you, the sponsor, for assistance before they seek social assistance from the government of Ontario. The OW or ODSP has informed CIC that a sponsored family member, your spouse, has received social assistance from the Government of Ontario, because you the sponsor are not providing support. CIC will ban you the sponsor from sponsoring any other family member until the debt has been paid off in full. The OW or ODSP has calculated the debt (social assistance received) and forwarded the case to the ORU. The letter will provide you the opportunity to reach an agreement with the Government of Ontario to start resuming support payments to your sponsored spouse; OR it will indicate they are starting to collect the debt you the sponsor owe. The ORU can also refer the case to the Canada Revenue Agency, or CRA. The CRA’s Refund Set-Off Program can garnish any Income Tax refunds you may be eligible for, in order to begin collecting the debt you the sponsor owe. The ORU can also initiate Court Action against you to begin collecting the debt. Your Credit Rating will be negatively impacted by this process and will mean it will be harder for you to successfully apply for a loan. If you the sponsor have been convicted of a sexual offence or an attempt/threat to commit a sexual offence, you will be ineligible to sponsor anyone even when the debt has been repaid in full. How Does a Sponsorship Breakdown Affect My Rights? You the sponsor must not yourself have been on social assistance for 12 months prior to initiating another sponsorship. You have not been on social assistance for at least 12 months prior to applying to sponsor a family member. Does NOT have the right to make the sponsored spouse leave Canada. Does NOT have the right any children or property under dispute. This will be settled in court under Family Law. The sponsored spouse is already a Permanent Resident. Contact the sponsored spouse directly – unless the breakdown is due to family violence – and offer them assistance to enable them to stop receiving social assistance from the OW or ODSP. If your offer of assistance is not accepted, contact the OW or ODSP to see what your options are and to remain informed of the situation. Try to reach an agreement with the OW or ODSP on how to resume providing assistance to your sponsored spouse and/or to begin repaying the debt. Provide partial support to your sponsored spouse (the debt will continue to accumulate). Contact a community legal clinic for advice on how to pay back the debt or advice on other options. What Can Stop or Postpone Debt Repayment? You the sponsor die (and the co-signer if applicable). You the sponsor (and the co-signer if applicable) have documented extraordinary circumstances: a serious health condition with expensive drug treatment for example. NOTE: if the circumstances of the sponsor are likely to change, the debt may only be deferred for 12 months, rather than cancelled and the debt will continue to accumulate until the end of the sponsorship period. What Prevents the Sponsored Spouse from Pursuing Sponsorship Support? The sponsorship has broken down due to family violence and the sponsored spouse has left the family home. What happens after the sponsor has paid off the debt in full? The ORU will send a confirmation letter to you the sponsor that the debt has been repaid in full and that the file is now closed. It is clear that a Sponsorship Breakdown can be a conflictive and drawn out process and should be avoided if possible. Ensure that you are well aware of your responsibilities as a sponsor before applying to sponsor a spouse to Canada and Ontario. 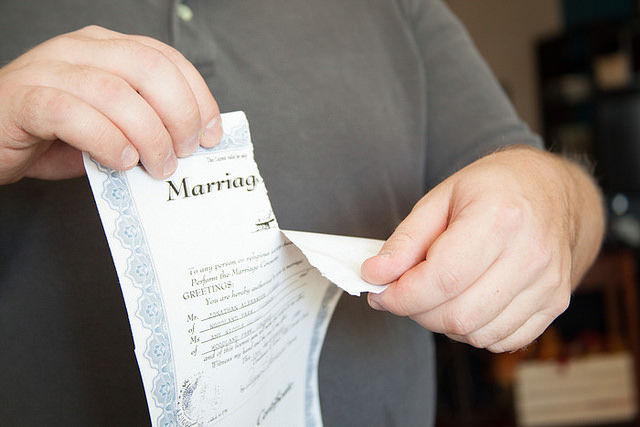 Immigroup will review your completed spousal sponsorship application. Immigroup will make sure you have not made any mistakes on your application or in gathering the documentation of your relationship. We will assess your sponsorship letter and give you peace of mind that you are submitting an application with a very good chance of success. Don't lose sleep at night worrying about whether you've done enough. Call us at 1-866-760-2623 for a review.